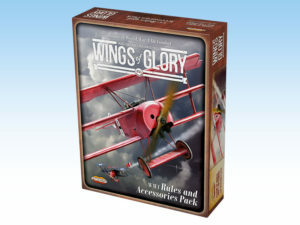 The WW1 Wings of Glory Rules and Accessories Pack is the perfect starting point for newcomers to the Wings of Glory system and, at the same time, a complete compendium for experienced players. Developed to present in one set all the rules and game materials (except the miniatures) that you need to play WW1 Wings of Glory, this product is also organized in a way that makes easy to start to play and to increase the mastery of the rules in logical and gradual steps. 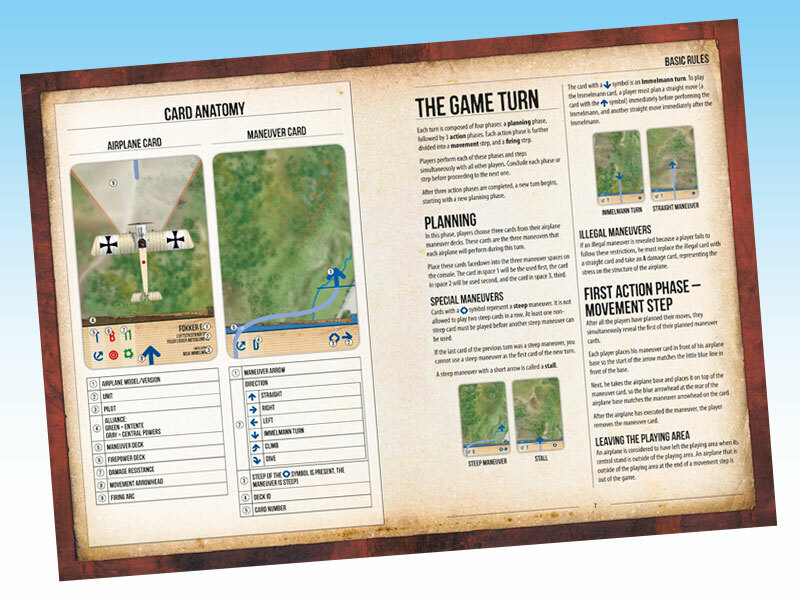 The 40-pages rulebook included allows players to easily customize the game according to their preferences and experience. A wealth of optional rules is included, each of them referring to the “level” of the rules they can be used with, so that it’s easy to expand the game, no matter which is the complexity of the rules set you like to play with. Also included are all the additional components required to play the game, such as airplane consoles, damage decks, special cards of many different kinds, rulers, and a lot of counters. 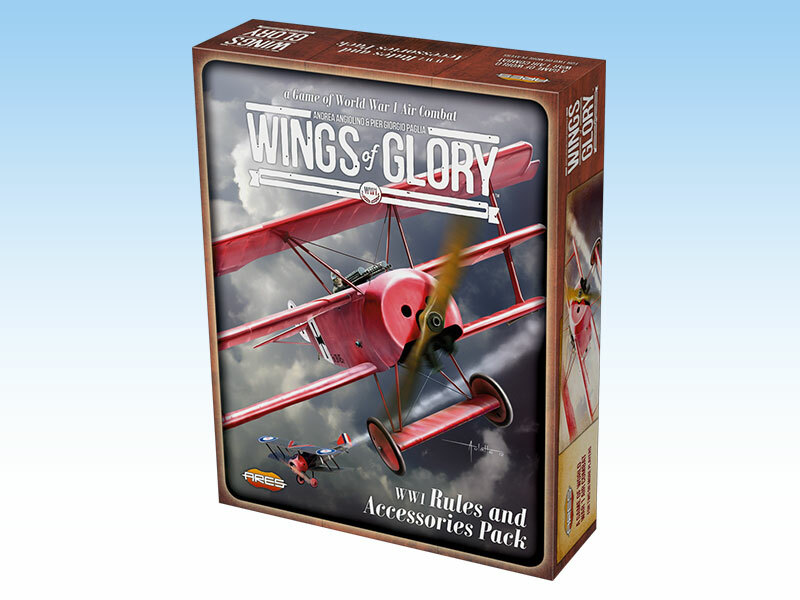 The WW1 Wings of Glory Rules and Accessories Pack collects all the game system rules previously released in several game sets and expansions, presenting them in a single place, so that you can play with any Airplane Pack in the WW1 Wings of Glory range. When an airplane requires additional specific rules, cards or counters, they will be included in its own Special Pack (as in the case of the Caproni Ca.3 or the Gotha G.V, for example). 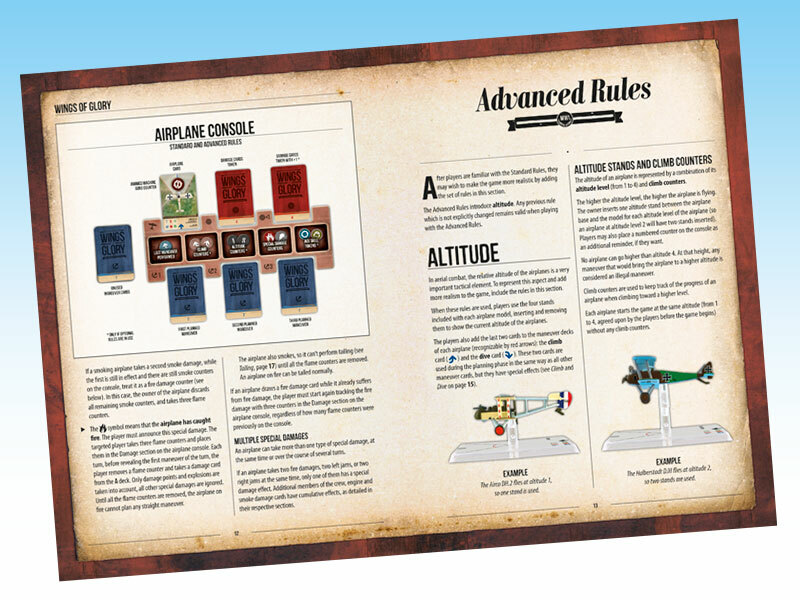 The most important component in the pack is the full color, perfect bound, soft-cover volume that presents the full extent of the WW1 Wings of Glory rules system. The 40-pages rulebook is divided in three difficult levels, with optional rules for each level. The rules are divided in three difficult levels, so players can get acquainted with the game mechanics step by step. The Basic Rules provide a very simple starting point to begin playing and learning the core concepts of the game; the Standard Rules make the game a little more challenging by introducing special damages and their effects; the Advanced Rules introduce variable altitude levels, climbing and diving into the game to add a greater level of realism. In the Advanced level, the most important addition is the introduction of altitude in the game. In aerial combat, the relative altitude of the airplanes is a very important tactical element. The Advanced rules represent this aspect, which for the sake of simplicity is not included in the Basic and Standard rules, and add more realism, changing significantly the game. When altitude rules are in use, players employ the four stands included with each airplane model, inserting and removing them to show the current altitude of the airplanes. Besides that, the players also add the last two cards to the maneuver decks of each airplane (recognizable by red arrows): the climb card and the dive card. These two cards are used during the planning phase in the same way as all other maneuver cards, but they have special effects. Altitude affects maneuver, as different airplanes have different climbing rates and maximum altitude they can fly at, and differences in altitude affects the way airplanes fight, both against each other and against ground targets. An interesting point of this set is that whatever the level of complexity used, players can elect to use optional rules to add more details to the game. A player using the Basic rules can already employ optional rules specific for this level, prior to learn the Standard or the Advanced Rules. In the section dedicated to the Optional Rules, beside the title of each rule there is a symbol indicating the level of the rules that is required to use the rule. Among the Optional Rules, probably the most important addition of this pack is the set of Ace Rules. When using these rules, each pilot may have ace status, be a normal pilot, or be a rookie. Each ace may have one or more special skills, which each player may freely choose. A lot of different skills are included… Acrobatic Pilot, Daredevil, Height Control, Good at Escaping, Lucky Pilot, Chivalrous Aptitude, Strong Constitution, Super Ace, Bullet Checker, Incendiary Bullets, Technical Eye, Itchy Trigger Finger, Perfect Aim, and Sniper. 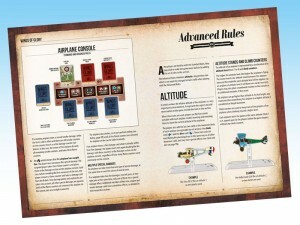 The Advanced Rules introduces the altitude, adding more realism to the game. The rulebook also presents the rules required to use a number of special airplanes (two-seaters, multi-engine airplanes), balloons, ground units (trenches, anti-aircraft machine guns and guns) and special weapons (rockets and incendiary bullets), as well as scenario rules (balloons, bombing and others). Beside the rulebook, the pack includes a number of game materials. There are four decks of Damage Cards (A, B, C and D), 6 Target/AA Machine Gun cards, 6 Trench/AA Machine Gun cards, 6 Trench/AA Gun and 5 Bomb cards. Four airplane consoles are presented (dual sided for use with either the Basic or Standard/Advanced rules), two rulers for determining range and 163 markers, tokens and counters, to handle special damage, ace abilities, manage altitude, keep track of your airplane status (damage to the crew, last maneuver taken…), and more. 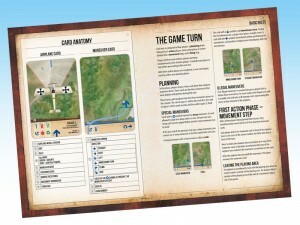 The WW1 Rules and Accessories Pack is the most complete rulebook to date for the WW1 Wings of Glory game system, with a logical structure for reading and learning the rules, and recommended to people wanting to get start in the game, as well to “veterans” interested in using the miniatures they already own with the new rules and models. Stay tuned for more information about this set and for new scenarios to download that will be posted on our website.